What is Shotokan Tiger Cub Karate ? What is a kindergarten class like? Hello, I am Laurence Vidler and I am five years old. 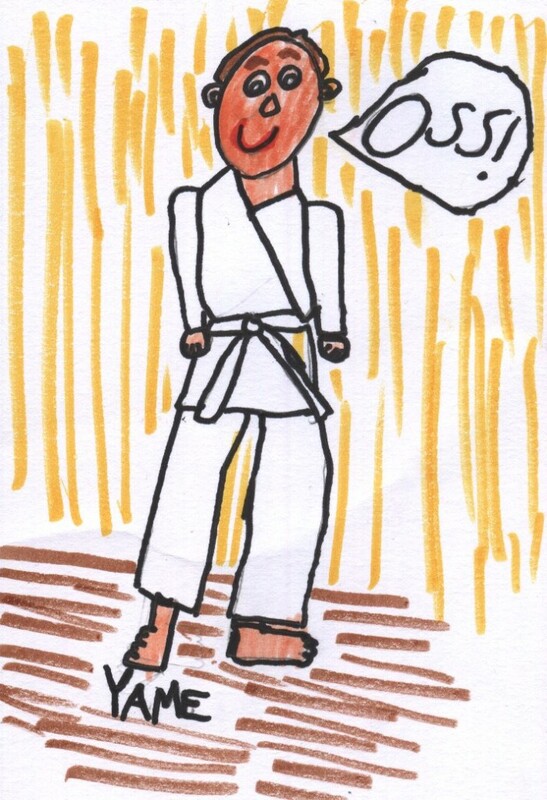 I started Kindergarten Karate when I was nearly four years old and I caught the karate bug straight away. First of all I learnt how to make a fist ready for punching. After that, I passed my first badges – sitting quietly for thirty seconds and standing still, which is harder than it sounds! We also got badges for awesome effort and exceptional attendance. I made great new friends, played fun games and even learnt how to skip with a skipping rope. When I had all thirteen badges (like downwards block, sidekick and Shuto) I was presented with my Gi and joined my daddy and brother in the big class. I have done five sessions now in the big class and I love it! It is more serious than Kindergarten Karate I am tired at the end, but I am working hard to get better with my moves and looking forward to taking my orange belt in the near future. Hello my name is Liam Matthew stone. I started karate at Rossendale Shotokan Karate Club four years ago and I loved it from the start. I started because sensei Ian Garside and sensei Stephen Warburton came to my school to show us some of the basics, as soon I got home I told my mum and dad I wanted to join. On the first night I got stuck straight in with my basics it took me a while but after a few lessons of working and trying hard I started to get the hang of it. The night of my first grading was a bit frightening but I got to meet sensei sherry for the first time the speed he moves is unbelievable and he has a keen eye for detail. I always tried to know my next kata in advance so I could be one step ahead. White belt to red belt for our kumite we had to do five attack I thought that was quite good. Then from yellow to purple and white we did one attack and every time we graded closer to purple and white a new kick got put in and by purple and white we had to do a spinning back kick called Ushiro Geri. one attack was even better than five attack and when I got to brown belt we do semi free and freestyle, for me that’s when it got really good. Now after four years of hard work I have my first dan and now working towards my second dan then third dan then fourth dan and fifth I think you know where I am going with this. RSKC is a fantastic community karate club, offering great instruction with qualified and highly skilled Sensei’s, family friendly fun and activities plus the opportunity for parents to be involved at all levels. Our son joined 4 years ago and has progressed to a black belt at age 11. He strives to further progress, growing in confidence and taking pride in his own achievements. I can see improvements in his self esteem, fitness levels and discipline through the ethos and environment created at RSKC. As parents we are encouraged to participate and feel valued as part of the club helping with fundraising, donations and contributing to events. We feel so strongly about the benefits of the club that my partner joined the committee and undertakes the role of club welfare officer! I joined RSKC 4 years ago and immediately felt part of the club. Everyone is friendly, lessons are fun with great Sensei’s and it keeps me fit and healthy. I like to join in with karate events like our club Bo and Bunkai classes with Sensei Ian 5th Dan, go along to special karate events provided free by the KUGB and help to Instruct during lessons. I am now a black belt and I am looking forward to progressing through the DAN grades learning new skills and techniques. I joined karate because some family members were doing it at the time. I enjoy sport and karate looked like something different and interesting. Now I have carried on with karate because it is a good way to keep fit and is a useful form of self-defence. I would like to progress through the Dan grades because this is the next step for me. I enjoy the many branches of karate such as bunkai, competition and Kumite. Elements of karate are fun, test your stamina, strength, agility and courage and karate allows you to improve in these areas. Learning a martial art gives you courage and confidence outside of the dojo and when people know you do karate they are impressed. I joined RSKC when I was 12. At the time I lacked self esteem and confidence and I would not stand up for myself when I was challenged. I joined the club to learn how to defend myself, to improve my fitness and my overall confidence. After 4 years I believe all of these have been accomplished and improved my academic and social qualities vastly. The club’s large number of social events and friendly atmosphere means I enjoy attending greatly and also means there is increased trust between Karateka which makes full contact training a much safer and enjoyable activity. I started karate at Rossendale Shotokan Karate Club about 4 years ago and found myself loving it from the very beginning. My dad had done karate for as long as I could remember so I sort of grew up with an interest in it. I had previously tried a different style of karate at another club but found that I did not enjoy it. From the first day at RSKC the friendly atmosphere of the club was instantly obvious to me and I felt very welcome. The varied lessons at the club meant I never got bored and was able to learn and practice diverse skills. Karate is a fun way to get fit and healthy. As you progress through the belts you feel more and more that you’re a part of the club. The birthday parties at the end of each month and the annual Christmas parties make you feel that RSKC is more than just a sports club. The club also holds regular special classes such as Bo and Bunkai classes. These are extremely enjoyable and allow you to practice your skills against weapons, such as knives and bats. I am now a Black belt and regularly take part in competitions. I hope tocontinue working through the Dan grades and developing my skills further.